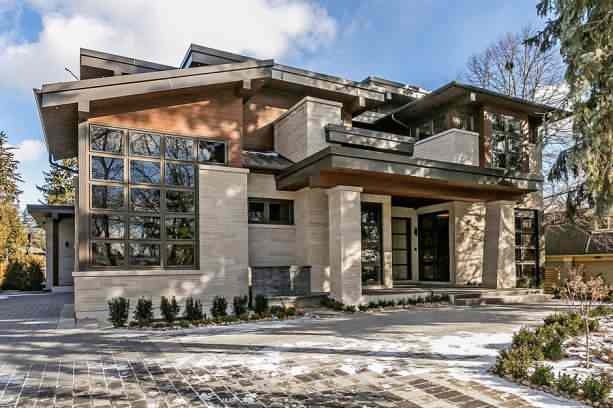 Exceptional home combining modern architecture, natural elements and timeless luxury. Approximately 9,000 square feet of total living space. Big windows, 2 atriums and skylight bring in lots of natural light. Views of greenery from all windows. 11’ ceiling height on main, 10’ on upper, 10’ in lower. Beautiful curb appeal with natural stone and roasted poplar construction. Loads of custom cabinetry everywhere: kitchen, mudroom, servery, vanities, closet organizers, floating shelves. All by Cameo. Lots of gorgeous walnut selections as well as rosewood, teak and bamboo. Amazing central cantilevered staircase with walnut treads and railings, glass panels, bordered by LED lights, skylight overhead and river rock below. Radiant in-floor heat in basement and all tiled areas on upper levels. Hotel-calibre wine cellar in walnut and lots of glass. Ultra cool lounge area with 2 storey windows, stone window wells and views of nature. Covered porch encloses awesome outdoor kitchen with top of the line appliances. 15’ swim spa. Stone wall with built-in gas fireplace and mounted TV. Beautiful design, finishes exudes quality, details that make you smile all in an atmosphere that feels natural.